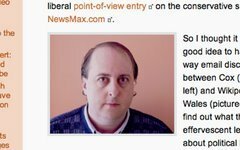 In yet another example of irresponsible blogging, Robert Cox has re-launched OlbermannWatch. As we suspected all along, and as I said last week, Cox could not be trusted to tell the truth. Does Cox think he is humorous pretending to quote Winston Churchill. Is it a lame attempt to mock our use of a photo of Winston Churchill in our Victory post? All we have to say to Cox and his minions is "Game On!"